How Do Bike Collisions Happen? Summer is an ideal time to ride a bike, either to commute without having to get into your car or to have fun outdoors while getting some exercise. Unfortunately, more than 900 bicycle riders are killed and close to 500,000 bicycle riders visit emergency rooms over the course of a year, according to U.S. Centers for Disease Control and Prevention. Riding a bike is risky because you do not have the protections you would have in a car in case an accident happens. Serious injuries or fatalities often result, and more than $10 billion a year is lost due to lifetime medical costs and loss of productivity resulting from bike accidents. Drivers who cause bike collisions can be held accountable for covering the costs of these losses, and victims can work with Boston bike injury lawyers to pursue claims against drivers who cause accidents by behaving carelessly or by not following the rules of the road. Both drivers and bicycle riders have a vested interest in preventing bike accidents, so it is important for bicyclists and motorists to understand why bike accidents happen and what they can do differently to share the road in a safer way. How Do Bike Collisions Occur? The majority of bicycle accidents happen in urban locations, according to CDC. When bike riders and cars are in close proximity to each other, this significantly increases the risk of accidents happening. Drivers may not know how to judge the speed of bicyclists and may cut them off on urban roadways, even when the bike rider has the right-of-way. Drivers also open car doors into the path of bicycle riders, or try to pass bicyclists when it is not safe to do so. And, because bicycle riders are harder to see in mirrors and drivers may not be anticipating a bike rider sharing the road, drivers could also strike a bicyclist when changing lanes or turning. Bicycle accidents are also much more likely to occur at non-intersection locations, the CDC explains. Bicycle riders must be aware they increase their risk of accident involvement if they try to cross the road at a location other than an intersection. 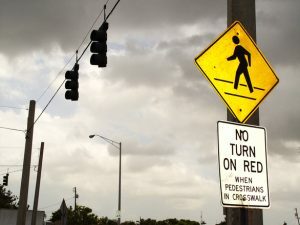 Massachusetts laws require bike riders who ride on the state’s roadways to obey the rules of the road, including traffic signals and bike riders should make sure they are crossing and turning at intersections when it is legal for them to do so. However, even if a bicycle rider does try to cross outside of a designated intersection, drivers could still be at least partially responsible for a collision if the driver was not paying attention or was otherwise doing something careless and the driver’s negligence contributed in some way to causing the accident. Under comparative negligence rules, a biker who was partially at fault for causing an accident by crossing outside of a designated walkway would be able to recover compensation from the driver but the compensation would be reduced based on the percentage of fault attributed to the bicyclist.